In the changing global environment, a suitable job is of utmost importance for the students.Thus, to facilitate this aspiration of the students we at Aravali College of Engineering & Management have a full-fledged Training and Placement department The Corporate Resource cell, which works towards the fulfillment of the students aspirations of having the best professional career. The Training & Placement Cell is an initiative by Aravali College of Engineering & Management to provide a comprehensive array of services and support for its students that will assist them in their life-long career development and placement. The department acts as a central hub for the overall development of the student for the final placement and is a storehouse of all information and resources. Corporate Resource Cell not only acts as an intermediary between the corporate world and the academic world but also provides guidance to the students for their choice of career. Training & Placement department also provides access to employers by generating ample opportunities for placements and brings awareness to the faculty and the students to prepare according to the changing demands of the industry. It maintains an ongoing corporate networking programme to place students and ensures a continuous flow of placement opportunities. Companies like Accenture, Wipro, Infosys Technologies, Samsung Software Labs, Syntel India Ltd., I- Flex, L&T Infotech Ltd., HCL Technologies, Tata Consultancy Services, Assurgent Technologies, Perot Systems, IBM, Tech Mahindra ltd., Sapient Corporation, Indian Army, Indian Navy, etc have been kind enough to provide placements to our students. The students have been from B Tech. 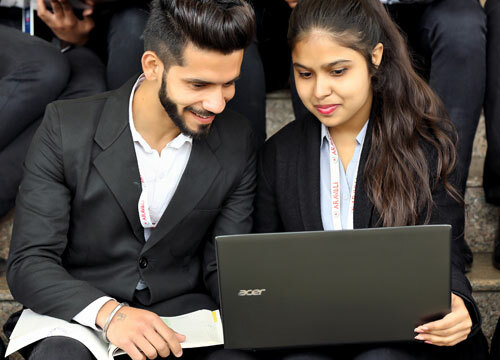 ( Computer Science, Civil Engineering, Electronics and Communication, and Mechanical branches), MBA, Many of the students have also taken up teaching as a profession and have been placed as Lecturers with various engineering college in the state of Haryana and neighboring states. lecture sessions by eminent professionals from industries and educational organizations of national and international repute. Organizing industrial visits and summer training. Interact with the corporate houses for the placement of graduating students. Maintain constant liaison with the concerned HR personnel of the companies visiting the campus. Counseling of students for career development. Undertake PDP programmes for the overall development of the student viz; verbal communication skills, group discussions, aptitude, attitude, competencies, interests, personality IQ/EQ development and interview techniques. Develop alliances with the academic arm of industries to offer their courses as electives besides the University curriculum.